The Massey women's sevens team (left) manager Chris Sharrock Stephanie McKenzie, assistant-coach Kahu Sturmey (Assistant Coach), Megan Bramley, Nicola Chase, Pia Tapsell, Tiana Davison, Kaitlin Bates and coach Strahan McIntosh. Front: Stephanie McKenzie, Lucy Brown, Sydnee Wilkins, Courtney Walsh and Marcelle Parkes. The Massey University women’s rugby sevens team has claimed the University and Tertiary Sport New Zealand Championship in a nail-biting final on Saturday. As the hooter sounded in the 14th minute of the final, Massey were trailing the University of Waikato 14-17. However, Pia Tapsell completed a last-ditch turnover and sent the ball out wide for Kaitlin Bates to run in a try. A conversion secured the title by 19-17. 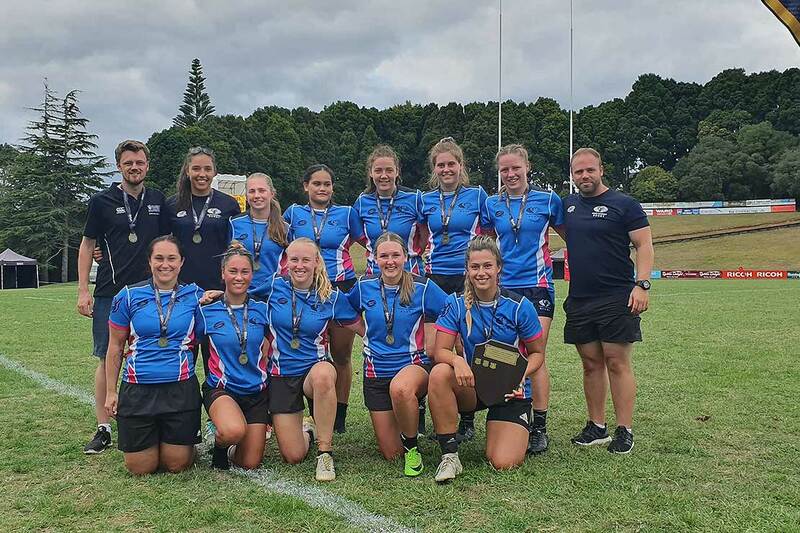 The team of eight featured players from all Massey campuses and three were named in the Tournament Team; Marcelle Parkes (Wellington), Pia Tapsell (Auckland) and Kaitlin Bates (Manawatū). The Massey team cruised through the pool stages, beating the University of Otago 22-17, the University of Auckland 44-0, and the University of Canterbury 22-12. Followed by a convincing 42-10 semi-final over Auckland University of Technology.